The new Al-Marah Arabian Horse Galleries exhibit at the Kentucky Horse Park in Lexington, Ky., is a must-see not only for Arabian horse enthusiasts, but for all horse lovers. It’s a wonderful representation and dedication to the history, beauty and talent of a breed that has played such an important role in human culture as well as the evolution of the horse. HI photographer Leslie Potter and I got a sneak preview of the exhibit just days before the grand opening. In the scurry to fix loose ends and finish construction, Bob Fauls and Sue Meyer of the Purebred Arabian Trust, and Bill Cooke of the International Museum of the Horse, were kind enough to take some time out of their busy schedules to walk us through the exhibit. From the entrance designed as a desert cave, complete with pictographs of horses on the “rock” walls, to the art gallery featuring sculptures and paintings of Arabian horses, the Galleries takes visitors from the breed’s origins to its role in today’s horse world. 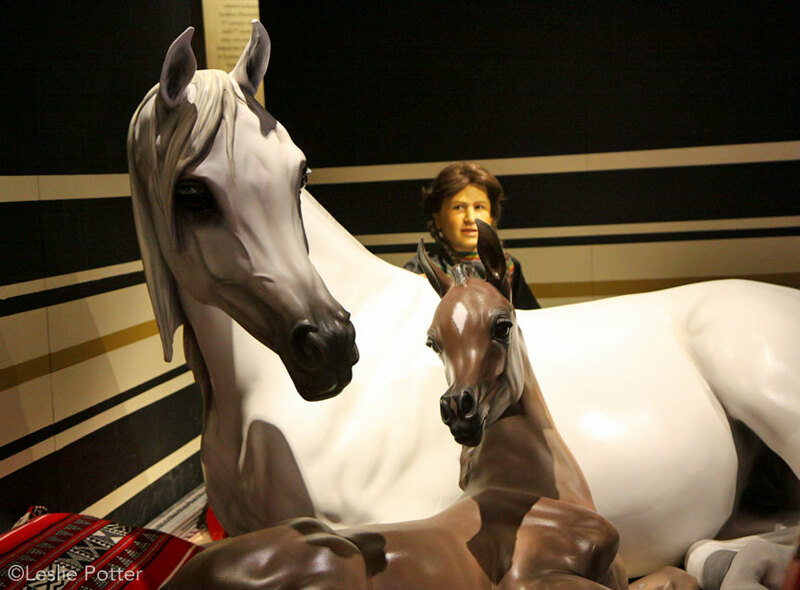 In addition to life-size, realistic fiberglass horses, authentic artifacts and historical displays, video and audio elements, and beautiful works of art, the Arabian Horse Galleries incorporates an amazing interactive element for kids. First, they scan a card across a touch-screen TV and choose an animated Arabian Horse avatar. After learning a little bit about their horse, they continue through the exhibit, and each time they see one of these interactive monitors (called Discovery Oases), they scan their card again to learn more about their horse and the Arabian breed as they play games and answer quiz questions. Visitors will also learn about influential breeders, famous horses and their pedigrees, and the breed’s migration to and influence on Europe and the United States. Plus, discover the Arabian’s talent in equestrian sports, their popularity as a loving companion to humans, and so much more. The generous $10,000,000 donation from the Purebred Arabian Trust that made this exhibit possible is the largest gift ever given to the Kentucky Horse Park. As a permanent addition to the International Museum of the Horse, the Al-Marah Arabian Horse Galleries will be something horse park visitors can enjoy for years to come. If you’re planning a trip to Lexington and the Kentucky Horse Park, make sure you add the Arabian Galleries to your itinerary!